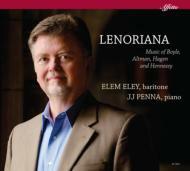 Lenoriana, featuring the baritone Elem Eley and pianist J.J. Penna, consists entirely of recording premires. An eight song cycle on poetry of Poe, Benjamin C.S. Boyle's Lenoriana is divided into two halves, revolving around the central axis of the poem Lenore, a paean for a love lost too early and misunderstood by most. Laurie Altman's settings of two Frost poems were composed at the request of Mr. Eley. A Time to Talk attempts a tightness of structure, moving forward both quickly and conversationally; the Sound of the Trees is far more languid and restrained. Daron Aric Hagen's Larkin Songs cycle works very hard to be as simple as possible. The poems are like a portrait of a man looking back over the course of his life; the music gives you the interior material. Martin Hennessy's Three Dickinson Songs closes the program. I TASTE a liquor never brewed) was written for Mr. Eley. Elem Eley enjoys a remarkably varied career, from opera, oratorio and recital to premires of contemporary vocal music. He is Prof. Of Voice at Westminster Choir College of Rider University. J.J. Penna has premiered song cycles by William Bolcom, Ricky Ian Gordon, Richard Hundley, and Lowell Liebermann. A frequent recital pianist for top-echelon singers, he has been a Julliard School faculty member since 2006.